James Orr, a schoolteacher from Drakemyre (at that time, a small suburb village on the Rye Water), opened a private school at Templand Cottage called "Orr's Academy", where he taught up to thirty children in two small classrooms. The classroom sizes were 22' by 14' and 15' by 12' and other facilities included the headmaster's office, a small cloakroom and an outside water pump for washing and drinking. There was no hot water and no indoor toilets for boys and girls; if there was an outside toilet, it was likely to have been basic, to say the least. Orr's Academy was open for only seven years and closed for good as a school in 1835. From the archives of Dalry Burns Club (1830) : "During the evening, Messrs James Orr and Andrew Neil arrived as a deputation from the Junior Burns Club and we sent John Hamilton and James Muir to the Junior Club in return." In 1835, the name was changed from Orr's Academy to "Templand" or "Templeland" Cottage. The parish records state that Templand Cottage and offices were owned by a Mr. John Hunter, a local baker. He lived at "Rosebank" with his wife, Jean Hunter, their seven children and a servant. John Hunter ran a bakery with his brother, James, somewhere in Dalry. John Hunter died in 1850. The cottage was leased to the Roman Catholic Church. Father William Burke, aged twenty-six, gave himself the challenge of supervising the building of St. Palladius RC Church. He moved from Ireland, with his "housekeeper" Elizabeth McMillan, and on 24th. April, 1847 he moved into Templand Cottage, at that time let by John Hunter. 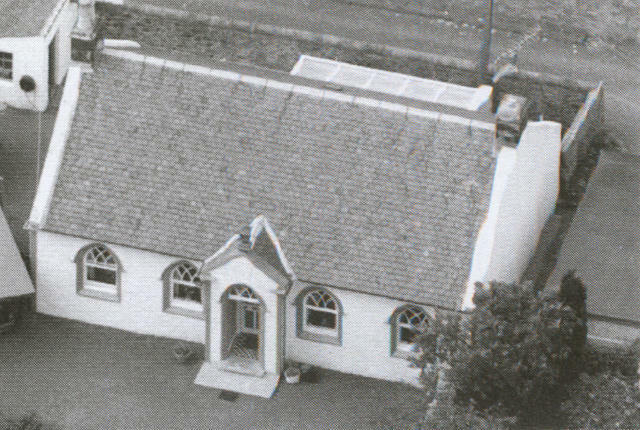 Father Burke lived in the cottage for just over four years, during which time he had undertaken "eleven weddings, fifty-two baptisms and twice-daily masses"; all were held at Templand Cottage. In 1850, John Hunter's executors sent a letter to the Roman Catholic Church addressed to the Reverend Haggarty informing him of John Hunter's death; the Church continued renting Templand Cottage until St. Palladius was built. St. Palladius was completed and Father Burke moved to his new house next to the chapel, where he was the local priest for more than thirty years. During this time, Mrs Hunter moved to Templand Cottage from Rosebank, according to the 1853 Census. The description of the cottage stated: "a handsome Cottage, with garden, at the North end of Dalry" and "an old house with a garden attached, a little West of the New Houses, the property of Mrs Jean Hunter, derivation unknown." Sometime during 1858, Mrs Jean Hunter sold Templand Cottage and offices to Neil Dorman, a china and glass merchant, born in Ireland in 1800; his wife, Mrs Rebecca Dorman, was born in Ireland in 1803. They had a daughter, also named Rebecca, who was born in Dalry in 1835. The family moved from a smaller property in North Street to Templand Cottage, allowing more room to sell his merchandise as well as providing living accommodation. After the deaths of Neil and Rebecca Dorman (?1860s), from 1865 daughter Rebecca Dorman used Templand Cottage for teaching music: piano and violin. She held private music lessons at Templand Cottage for approximately fifty years. According to the 1871 census, Miss Rebecca Dorman, music teacher, and her servant, Flora Macallum from the Mull of Kintyre, still lived at Templand Cottage. Rebecca lived at the cottage for the rest of her long life until 1917; she died at the age of 82 years old. Hugh Shedden (Hugh Shedden & Son, Master Joiners) a local builder, purchased Templand Cottage but the tenant was a widow called Mrs Nicol. "SHEDDEN, residing at Elmbank, Templand Road, Dairy, Ayrshire, carrying on business under the style or designation of John Shedden & Son, Joiners, Templand Road, Dairy, Ayrshire, were sequestrated on the 5th day of August, 1927, by the Sheriff of Ayr-shire at Kilmarnock. The Meeting to elect the Trustee and Commissioners is to be held at two o'clock afternoon, on Tuesday, the 16th day of August, 1927, within the Royal Hotel, Dairy, Ayrshire. A composition may be offered at this Meeting and to entitle creditors to the first dividend their oaths and grounds of debt must be lodged on or before the 5th day of December 1927". All future advertisements relating to this sequestration will be published in the Edinburgh Gazette alone." In 1926, Mrs Mary Glover purchased Templand Cottage from Mr Shedden and then resold the property in 1943 to James Lang Scott and Mrs Susan Scott, a local midwife. They lived there until her death in 1984. The property was sold to Mr & Mrs William Hamilton, a local glass and china dealer and later the local paraffin seller. Mrs Margaret Hamilton passed away early in 2013. On 15th December, 2013, Templand Cottage was bought by Michael Tucker (Art & Antique Valuer) and Mrs Margaret Tucker, a dental nurse. After renovation, Mr & Mrs Tucker moved into the property on 9th December, 2013. We would not have been able to achieve all this if it wasn't for all their help.